This is arguably the nations’s darling for many years in South Africa, especially amongst the military personnel, but also to the public at large – South Africa’s First Lady, none other than the much loved – Ilsie Smuts, affectionately just known to just about everyone as “Ouma” Smuts. Gifts to the servicemen and women during the war reminded them of home comforts and reinforced the moral support they were getting from home in their fight against European tyranny, Especially over times like Christmas when family and “home” became a yearning for anyone enduring the hardships of war. Known as “Glory Bags” at the time, these parcels contained all sorts of reminders from home, Christmas Cake etc and collectable items such as Christmas anniversary cigarette tins, which became highly popular – stamped with an image of both Jan Smuts and Ouma Smuts and giving good Christmas wishes. You can even find some sold as collectables today. The concept would evolve later in the form of “Dankie Tannie” (Thank you Aunty) panels received from the Southern Cross fund for South African servicemen in the Border War. Any veteran today can attest how important receiving small gifts of support go a very long way to maintaining troop moral, and long may the tradition of volunteerism and support from home continue. To this day parcels of support from South Africa are sent to SANDF troops on Peacekeeping missions in Africa over Christmas. 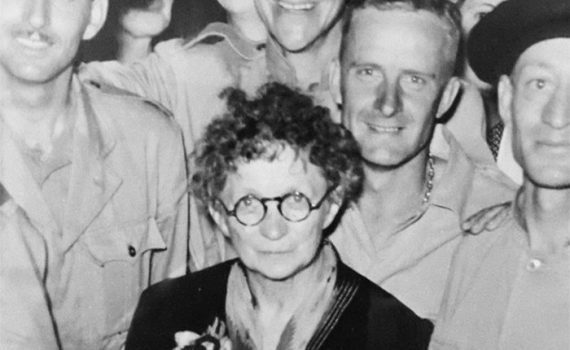 Not much is remembered of Ouma Smuts in modern South Africa, but this was a true woman who stood by her husband’s side as an equal in solid conviction with the “good fight” in the “war for freedom” (as it was called then) and her contribution to the war effort makes her one of South Africa’s most predominant women. Although her legacy is fading somewhat, over-shadowed by greater political events when the Smuts legacy came under such unrelenting attack after the ascent of the National Party in 1948. She however remains, to those who remember her and her contribution, a true daughter of South Africa. This rare photograph of Ouma Smuts is courtesy (and copyright) to Philip Weyers, a direct descendent of Jan Smuts and part of the personal collection of the Smuts family. Story for the South African Legion by Peter Dickens.